About six inches long. Grayish brown, the back streaked with black. Brown wings with white bars. Buff white underside. Narrow white stripe over the eyes. White and chestnut cheek patches. White sides and neck. Black throat and breast. An introduced species, it has prospered phenomenally, especially in conjunction with human habitation to the consternation people and other birds. The winged rat is in complete possession of the continent. English sparrows densely populate nearly the entire US and Canada up to the northern tree line as well as most regions world wide especially so with human populations. 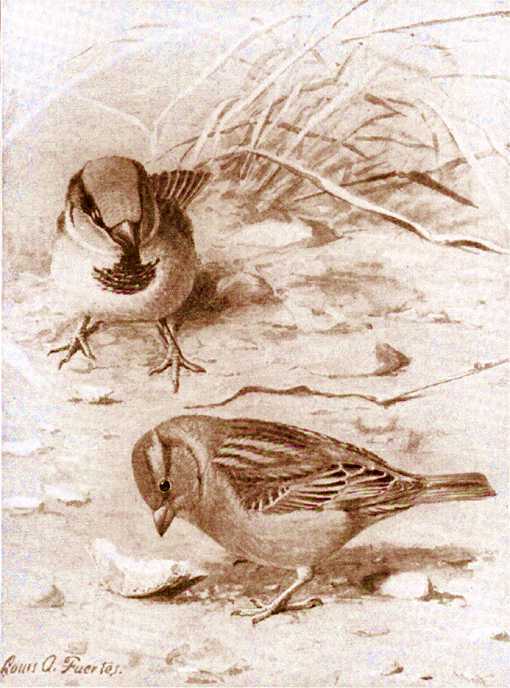 The English House Sparrow was imported to North America to protect trees from a caterpillar which is the larva of the Geometrid Moth. Many disagreed with the wisdom of this move and even predicted they would become pests as they fed on seeds and buds, not insects. Their words went unheeded. Even after initial efforts failed, reintroduction was not only renewed, a seemingly concerted effort ensured its start. Probably not but it might as well have been. 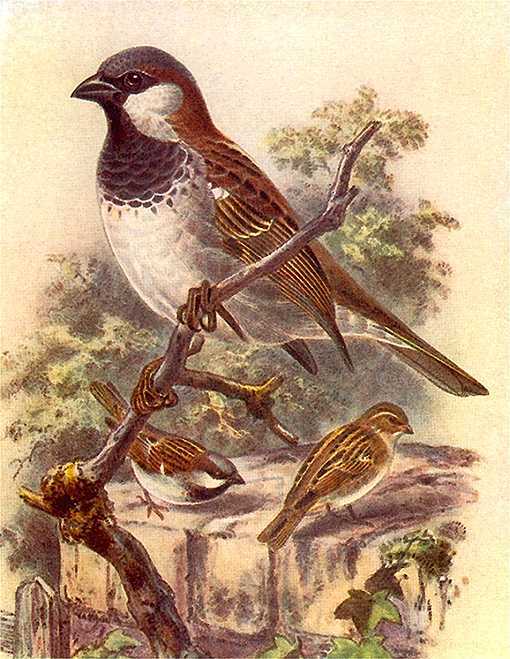 Sparrows now thrive throughout most of the continent. Eight pair were brought to the U.S. in 1850 for the purpose of ridding the shade trees of inch worms and in the spring of 1851 Nicholas Pike and other directors of the Brooklyn Institute released them in Brooklyn, New York. They did not survive. Nevertheless, destiny was on the side of the hoard and Pike arranged for the importation of one hundred more which were released in 1852 and 1853. In 1854 Colonel Rhodes imported and released some of the birds in Portland Maine and some in Quebec. Over the next ten years, a few hundred more were imported and released in Quebec and the areas around Portland, Boston and New York. Then in 1869, about one thousand were released in Philadelphia. They were released in San Francisco, Cleveland, Cincinnati, St. Louis and several other cities in the interior. Between 1874 and 1876 a few were released in Jackson and Owosso, Michigan and in 1881 they were introduced in Iowa. It wasn’t long before the destruction of crops, the spread of disease and parasites, competition with song birds, its filthy habits and a population explosion revealed its introduction was a huge mistake. Control and extermination attempts with bounties and poison have proved useless against such a pervasive species. It does considerable damage to grain crops and storage. The sparrow’s movements between farms expedites the spread of chicken lice and mites and livestock diseases which can be spread by mere physical contact. 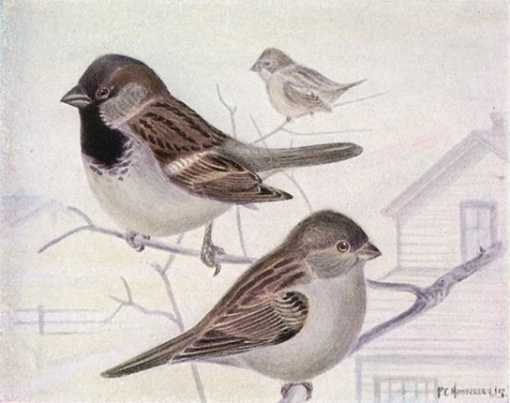 A few House Sparrows can multiply into thousands in a few years because they regularly raise three and sometimes as many as five broods per year, each brood averaging around five or six birds. It builds nests in almost any nook or cranny in farms, towns and cities. The droppings from large flocks roosting on houses and other buildings despoil window trim, porches and ornamental work. It eats buds, young sprouts, flowers and seeds of almost anything. It is a persistent adversary of many birds, especially those that seek shelter in bird houses or nest near humans including bluebirds, wrens, phoebes, tree swallows, purple martins, song sparrows, chickadees, flycatchers, thrushes, tanagers, robins and more. Since it is a year around resident it has a head start in the spring, invading the bird houses we place for migrating song birds. It dominates feeders intended for song birds leaving most of the seed on the ground uneaten. Monitor bird houses with entrance holes larger than 1 3/8″ diameter. House sparrows usually prefer larger holes. The Side Mounted Birdhouse, has an entrance hole of 1 3/8″ diameter for that reason. It will accommodate chickadees, wrens, swallows, nuthatches, titmice and more. Is possible some small sparrows may fit. The winged rat is in complete possession of the continent. English sparrows densely populate nearly the entire US and Canada up to the northern tree line as well as most regions world wide especially so with human populations. Control and extermination attempts with bounties and poison have proved useless against such a pervasive species. It does considerable damage to grain crops and storage. The sparrow’s movements between farms expedites the spread of chicken lice and mites and livestock diseases which can be spread by mere physical contact. Since it is a year around resident it has a head start in the spring, invading the bird houses we place for migrating song birds. It dominates feeders intended for song birds leaving most of the seed on the ground uneaten. Monitor bird houses with entrance holes larger than 1 3/8″ diameter. House sparrows usually prefer larger holes. The Side Mounted Birdhouse, has an entrance hole of 1 3/8″ diameter for that reason. Assemble with corrosion resistant screws fit to pre-drilled countersunk pilot holes. See each species page for specific or general mounting locations and heights.